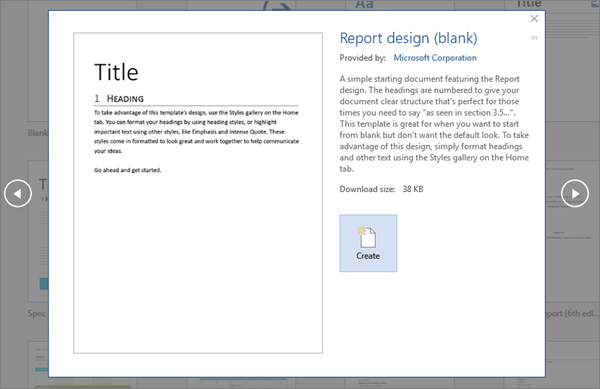 To create a document, simply open Word, select a blank document or template, and start typing. 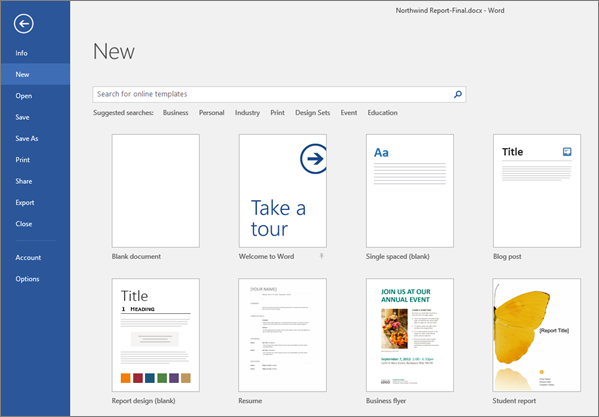 Word offers many professionally designed templates to help you create letters, resumes, reports, and more. Open Word. Or, if Word is already open, select File > New. Double-click a template to open it. Tip: Pin templates you like, so you always see them when you start Word. Select the template and then select the pin icon that appears next to the name of the template. In the Search for online templates box, enter a search word like letter, resume, or invoice. Or, select a category under the search box like Business, Personal, or Education. Click a template to see a preview. Click the arrows on the side of the preview to see more templates. For more templates, see Office templates & themes.